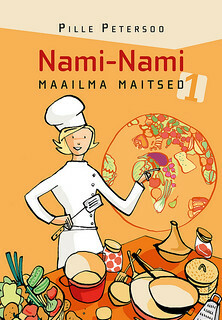 Recipe by Pille @ Nami-Nami. Above photo by Juta Kübarsepp for the October 2013 issue of Kodu ja Aed ("Home and Garden", an Estonian monthly magazine. I've been their food writer since October 2012). 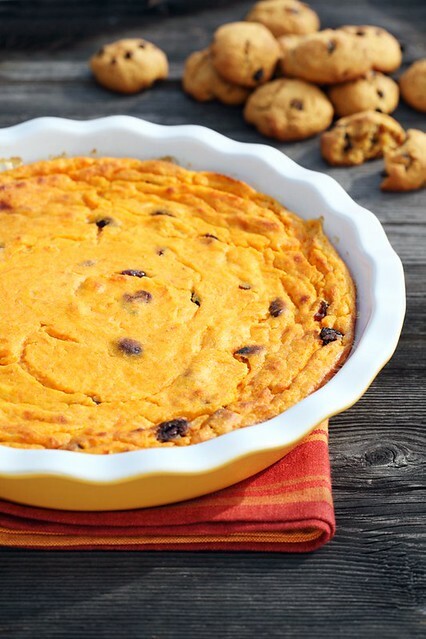 Pumpkin or winter squash dessert, anyone? 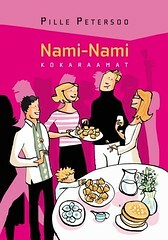 There's a popular old-school dessert here in Estonia, called kohupiimavorm. It consists of curd cheese (also known as quark), sugar, (whisked) eggs, and some add-ons, usually raisins or pieces of fruit. It's not really a cake (too soft), nor a soufflé (no custard base), so after some research I've decided to translate it as pudding cake :) Pudding cake is a cake you need to eat with a spoon, and it's rather difficult to cut it into neat shapes when still warm. Here's a version using that autumn staple, winter squash or pumpkin. For once, this is a recipe that's very versatile - if you cannot find curd cheese (try looking for 'tvorog' at your nearest Polish/Russian/international shop), you could use drier ricotta or even farmer's cheese. As for pumpkin, any yellow-fleshed winter squash would work. I like using butternut squash here, as this gives the dessert a lovely dark orange hue. Considering the amount of flour in the recipe, you could easily make this wheat-free or gluten-free by using different types of (gluten-free) flours. You could eat it as it is, or with a dollop of thick yoghurt or sour cream on the side. It's lovely with a kissel or fruit soup (this cranberry kissel would work brilliantly here). I actually prefer this pumpkin version to the traditional version, as it's softer and moister. Oh, and if you were wondering what those cookies on the top right corner of the photo were, you'll be pleased to know these contain pumpkin/squash as well. You'll find the recipe for those wonderful pumpkin cookies here. Peel the pumpkin, cut into large wedges. Remove the soft core and seeds, and cut the flesh into large cubes. Weigh the pumpkin cubes - you need about 800 g (just under 2 pounds). Place the cubes into a large saucepan, add a cup of water and simmer over a low heat until pumpkin is tender. Drain thoroughly, then place into a bowl and mash with a fork. Add lemon juice and grated zest, curd cheese, flour, (c)raisins. Separate the eggs. Whisk the egg yorks with sugar until creamy, add to the rest of the ingredients. Finally, whisk the egg whites with a pinch of salt until stiff peaks forms. Fold 1/3 of the egg whites into the rest of the ingredients, then gently fold in the remaining egg whites. Butter a large (round) oven dish - about ∅ 26-30 cm is excellent - and sprinkle with fine breadcrumbs. Spoon the pumpkin and curd cheese mixture into the dish, smooth the top. Bake in the pre-heated 200 C/400 F oven for about 40 minutes, until it's lovely golden brown, and just a wee bit wobbly in the middle. Let cool either completely or serve at room temperature. Looks delicious. I'm wondering if Quark is similar to what's called cottage cheese in the U.S.? Interestingly, the LA Times had a piece on making your own quark. Seems easy enough, and I love crustless custard-y squash type of pudding cakes. I make them in ramekins, and they're the essence of autumn. Kalyn - that's a tricky question. We translate kodujuust as cottage cheese, and although it can successfully be used instead of quark in many recipes, it's not exactly the same thing (for some reason I've always thought that cottage cheese and farmer's cheese are the same thing). See Tanita's link in her comment for making quark at home - and I'm sure your local Trader Joe or WholeFoods would stock quark as well! Tanita - thank you for the quark-link! I can see it working with cream cheese, but ricotta would give a lighter and fluffier result. I'm so glad to see this post! I LOVE pumpkin and I have some tvorog in the fridge that I need to use up soon! I know what I'll be making :) This recipe totally reminds me of the Ukrainian cheese-cake made for Easter. I can't wait to try out this pumpkin version to see if it brings back memories. Renuka - do give it a try! Not sure what type of dairy product you have available, but sure you'll find something suitable! I would like to hire someone to make it for me. It looks really really good.